Note: For cheats to this game, click here. The Kingdom Hearts series currently has five main titles released for North America: Kingdom Hearts, Kingdom Hearts: Chain of Memories, Kingdom Hearts II,Kingdom Hearts 358/2 Days, and Kingdom Hearts: Birth By Sleep. Like Chain of Memories, 358/2 Days (referred to as “Three-Five-Eight Days over Two”) comes in between KH and KHII. In 358/2 Days, however, the game has a different protagonist. Instead of starring the usual protagonist, Sora; it stars Roxas, a boy who was first introduced in KHII. The 358/2 Days game takes place throughout the events in Chain of Memories. The group called Organization XIII just got a new member into their team - Roxas. At the beginning of 358/2 Days, Roxas starts off kind of lifeless. As the game progresses, however, Roxas gains a personality. The Organization hires Roxas to kill “heartless” (strange beings that eat people's hearts), and to do a bunch of other stuff throughout the whole game. A week later their group gets another member whose name is Xion (pronounced Shee-on). Xion begins like Roxas and gets a personality later in the game. Through most of the game Sora is sleeping in a special pod that will help him recover the memories that he lost in Chain of Memories. A strange thing about the Organization members is that they may look like humans but they're really heartless beings called “Nobodies.” The Organization takes the hearts that Roxas collects and gives it to a heart-shaped moon that they believe will give them hearts of their own. This heart-shaped moon is Kingdom Hearts. After every mission, Roxas, Xion, and Axel ( Roxas' best friend) meet at the top of a clock tower to enjoy some sea-salt ice cream (yuck!). That's the basic storyline of the game. While the story is a little weaker than the other games, it is still a good one. It's also a little less confusing as long as you have played the other games. 358/2 Days' game play is very similar to the console titles. You are put in a free-roaming world trying to accomplish the objectives that you are given. This game, however, limits you from going everywhere because at certain places, you'll see a big X in front of the unavailable area. While exploring, you fight plenty of the heartless in real-time combat and gain experience points which will help you level up. In this game, you don't do anything but mash the same button over and over again (aside from using magic) to attack, but I had too much fun to notice anyway. Throughout the game, you use a key/sword thing called a keyblade, which is the basic weapon of the Kingdom Hearts series. The weapon becomes customizable and can be upgraded later in the game. You also obtain stuff like items and munny (yes, they spell it that way) found in treasure chests and enemies in the worlds you visit. Basically, it mixes the RPG genre with the Action-Adventure genre. Unlike the console titles, you start at a sort of hub world. Then, you receive your objective(s), go through a series of levels/missions, and repeat. Each mission tells you to do something like killing a certain amount of the heartless, doing reconnaissance in specific worlds, and occasionally defeating bosses. In this game, you are given a panel system. The panel system is a bunch of empty blocks that you fill with stuff that you either find in missions, or purchase at a moogle store (moogle is actually the only character from the Final Fantasy series that appears in this game). After every mission, you unlock more empty blocks that you can fill up with items. This system maybe a little confusing, but it is helpful for when you need to change your character's settings. However, the panel system is only customizable in the hub world that you start at before you go do another mission. Even though the game play isn't exactly like KHII, it still has some of the best game play on the DS (in my opinion). A new addition to this game is the multiplayer mode. Up to four players can help each other finish missions. The unfortunate part is, there is no multiplayer story mode. Also, you need a game cartridge for each player in order to play. I like how they chose this feature for this game since it's a DS game, meaning that you don't have to share a screen. What's cool is that you can choose up to 19 different characters in multiplayer mode! Note: Six characters need to be unlocked before being playable. There's not a lot of voice acting in this game since it's a DS game. However, when the characters do speak, I find that the voice acting is well done. The music is almost completely borrowed from other Kingdom Hearts titles, so if you've played both KH1 and KHII, you'll recognize almost all the songs. In other words, the sound in 358/2 Days is really good, if not great. For a DS game, the graphics are amazing! All the scenery and characters look really good. It's surprising that Square Enix could fit the open worlds from the console games into this one. After all, the DS can only hold so much in one game cartridge. Of course, that means that all the worlds except for Neverland from Peter Pan look exactly the same as they did in the console titles. Still, it's awesome that you get to see PS2 graphics at certain points in the game. As for stability, I found no glitches or bugs in this game. Everything held together perfectly. The controls in this game seem perfect for the DS. The game has two different control options. In control option A, you jump by pressing B, attack by pressing Y, and press the R button to put the camera behind you. After a few missions, you unlock control option B. The only difference in control option B is that it allows you to control the camera angle by pressing the L and R shoulder buttons. Like the other KH games, 358/2 Days is pretty clean. The only real concern is that you fight a lot of the heartless (-3.5 pts.) but there is no blood (unless you count the black smoke that comes out of them). You use magic (-1.5 pts. ), but it's just like shooting fire out of your weapon and curing yourself. One of the Disney characters isn't wearing a lot of clothes, but she isn't even in the game for more than a minute or so. The Genie from Aladdin is kind of supernatural, but also makes a brief appearance. If you played the other games, you'll notice that the organization you work for in this game is the group of villains in KH2. In this game, however, you don't do anything evil, so I'm not going to count off any points for that. Also, the ending is kind of sad, and is not recommended for younger players. The Kingdom Hearts series is one of my favorite video game franchises! 358/2 Days isn't a necessary chapter in the series, but it is still worth getting. 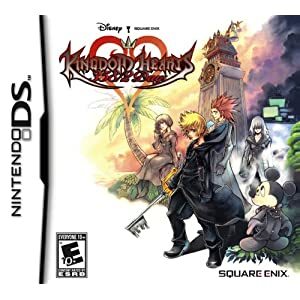 However, I recommend this game for those who know the rest of the Kingdom Hearts story because if you don't know the rest, you\'ll probably get lost immediately. The game is surprisingly difficult, so I think that the game being rated E10+ is pretty accurate. If you get this game because of the Disney characters, then you will be disappointed since Mickey and the other Disney characters are only in the game for two minutes. Click here to visit the official 358/2 Days site. Click here to visit the official Kingdom Hearts site.